US president John Adams, as we saw in previous posts, made a trip along the North of Spain in 1787. He documented really well the way of living of the Basques and Spanish in his diary, as extracted from his book: "The Works of John Adams, Second President of the United States". Rode from Ezpexo (nowadays Espejo) to Orduna (nowadays Orduña), four leagues. The road is made all the way at a great expense; but the descent of the mountains of Orduna is a great curiosity. These mountains are chiefly rocks of a vast height. But a road has been blown out of the rocks from the height of the mountains, quite down into the valley. After winding round and round a great way, and observing the marks of the drills remaining in the rocks, the road at last came to a steep, where the only method of making a road for a carriage up and down is by serpentining it. There is a fertile valley, and well-cultivated, at the feet of these mountains, in the centre of which is the village of Orduna. In this narrow space they have crowded two convents; one of Frailes, the other of Monjas. In the afternoon we followed the road which pursues the course of a little river, which originates in the mountains of Orduna, and rode down between two rows of mountains to Lugiano, where we put up for the night, four leagues from Bilbao. We have met, to-day and yesterday, great numbers of mules loaded with merchandises from Bilbao. The mules and their drivers look very well in comparison of those we have seen before. Their burdens are salted-fish, sardines, cod, and a sort of fish that we see here very plenty, called besugo. They carry also horseshoes, ready made, in Bilbao, to sell in various parts of the kingdom. The mountains of Biscay, of Bilbao, of Orduna and Pancorbo, for by these names they are called, are the most remarkable that I have seen. Followed the road by the side of the river, between two rows of mountains, until we opened upon Bilbao. We saw the Sugar Loaf some time before. This is a mountain in the shape of a pyramid, which is called the Sugar-Loaf. The town is surrounded with mountains. Took a walk down the river, which is pleasant enough. After dinner, the gentlemen accompanied us to the parish church over the way; then to the old parish church of Santiago, which was certainly standing in the year 1300. The high altar appears very ancient, wrought in wooden figures, the work very neat. The choir and the sacristy, &c. as in all others. 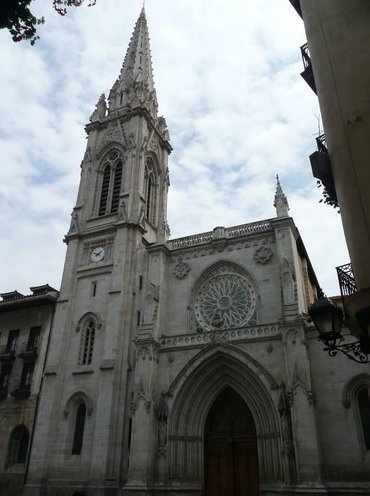 Bilbao Santiago Cathedral as it can be seen today. Walked round the wharf upon the river, through the market. Saw a plentiful market of fruit and vegetables, cabbages, turnips, carrots, beets, onions, &c.; apples, pears, &c.; raisins, figs, nuts, &c.
Afterwards met Messrs. Gardoquis, who went with us to show us a number of shops, — glass-shops, china-shops, trinket-shops, toy-shops, and cutlery-shops. I did not find any thing very great . There are several stores and shops, however, pretty large and pretty full. Went down the river… We dined at the tavern on shore, and had an agreeable day. … arrived at the river, or rather the brook, that divides Spain from France. The houses in Biscay and Guipuscoa appeared to be larger and more convenient than those in Galicia, Castile, or Leon, but the public houses were much the same. In the last house in Spain we found one chimney, which was the only one we saw since we left that in the house of M. Destournelles, the French Consul in Corunna. 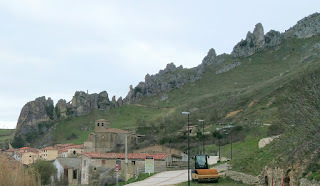 In our course we saw a few villages, and particularly Fontarabia, at a distance. We reached St. John de Luz, the first village in France, and there we dined; and never was a captive escaped from prison more delighted than I was; for every thing here was clean, sweet, and comfortable, in comparison of any thing we had found in any part of Spain. … Bayonne. Here we paid off our Spanish guide, with all his train of horses, calashes, wagon, mules, and servants. To do them justice, they had always shown a disposition to assist and be friendly to the utmost of their power; and we had no cause to complain of any improper behavior in any of them. Happy to see that the Spanish guides were having nice reviews also by the US President! Hope that we can meet so that you can experience as well the Basque hospitality!